Trusses are made of soft aluminum tubing and are easily dinged and dented. 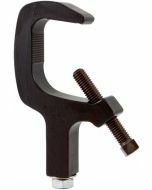 A c-clamp tightened onto a truss will leave a deep dent, which ruins the truss load rating. C Clips are springy plastic PVC clips that snap on to 2" diameter truss tubing to protect the aluminum from damage. 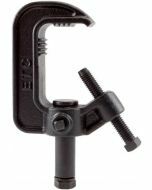 You can crank a c-clamp down onto a C Clip without fear of damage. C Clips are simple, inexpensive, and will save your very expensive aluminum truss. 2.1" x 2.3" x 2"